This release of Microsoft DaRT (Diagnostics and Recovery Toolset), Is suited to the Windows 7 version of the operating system In the 32 bit architecture. It comes In a bootbale ISO Image file that allows you to boot Into an OS that fails to start and diagnose and repair Issues thereafter. You can diagnose Issues with the "Crash Analyzer" tool, recover data on local computers, uninstall Windows Updates hotfixes, use the "Explorer" tool to navigate through directories on the local hard drive and heaps more. This Is an all-In-one toolset to fix a variety of problems and get your system up and running again. 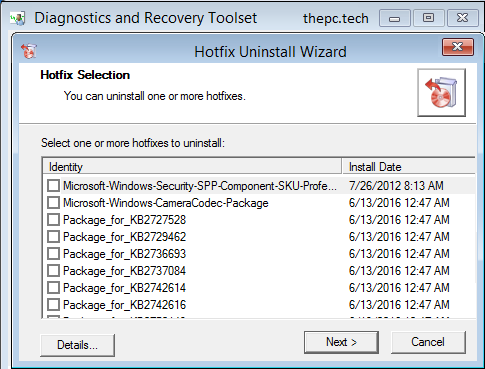 Microsoft Diagnostics and Recovery Toolset (DaRT) 7 lets you diagnose and repair a computer that cannot be started or that has problems starting as expected. By using DaRT, you can recover end-user computers that have become unusable, diagnose probable causes of issues, and quickly repair unbootable or locked-out computers. When it is necessary, you can also quickly restore important lost files and detect and remove malware, even when the computer is not online. One of the recent additions DaRT is the Microsoft Standalone System Sweeper, a full-fledged stand-alone anti-virus scanner. It uses the same engine and signature database, as in all Microsoft antivirus products (including, Windows Security Essentials). The engine is quite well-proven in terms of the effectiveness of virus detection. Additionally, if you've forgotten or lost the local user account password on your PC, DaRT can boot Into your system and reset the password with incredible ease. In fact, I have not come across a single local user account password that DaRT failed to reset. For all features and tools of Windows 7 DaRT 7.0, please visit the official website below. This version of DaRT Is also suited to Windows Server 2008 R2.